Hello! It's Chris with you today. I hope you all had a wonderful Memorial Day weekend! Today I'd like to start by announcing the winner of one of the prizes from the May 19th My Sweet Petunia/Technique Tuesday Collaboration hop. The winner is Sue D.! Congratulations, Sue! Sue, please set up an account at My Sweet Petunia, then email hello@mysweetpetunia.com and say you are the Technique Tuesday blog hop winner. If you already have an account, just email to claim your prize. Today I have a quick post using some of the more recent Turnabout stamps from Concord & 9th. The Turnabout stamps are so much fun to stamp, creating colorful patterns and backgrounds, and using your MISTI makes this type pattern stamping such an absolute breeze. Here is a simple Father's Day that I created using the Mosaic Turnabout stamps and the jig I created to fit in my MISTI for easy and nearly foolproof stamping of these fun backgrounds. I begin by creating a jig for these stamps. I carefully cut a 6 1/2 x 6 1/2" square from heavy tag weight cardstock. This will become my base to hold my actual card panel. Using the diagonal line on my cutting mat, I use a piece of Purple Tape to secure my square in place, then lining up by ruler on that diagonal line, I drew a pencil line from corner to corner. I turned my square and repeated the process for the other diagonal. Where those two lines intersect is the center of my jig. Next, I remove the Mosaic Turnabout stamps from the carrier sheets, and then replace one of the stamps stamp-side down to one of the carrier sheets. I like to use the carrier sheet, to make it easier to move the stamp into place. The stamps come with a printed guide on the back of the stamp set. I removed the mouse pad from my MISTI placed the printed guide into my MISTI and used the bar magnet to secure it. Then I lined up the stamp set exactly over the printed guide. Using the diagonal lines on the printed guide, I drew the lines using a fine-tipped Sharpie marker onto the back of the stamp. This shows the lines drawn on the back of the larger stamp. Next, I did the same process for the smaller "inner" stamp from the set. Now they are both ready to stamp! I have replaced the mouse pad, and added my jig into the corner of my MISTI. Now, since this large stamp has no center point, I carefully line up the stamp with the diagonal lines on my jig. When I have them so that they line up completely in all four marked areas, I should be centered on my jig! Now I can close the lid and pick up the stamp and it will be centered. I added an A2 panel of natural white cardstock to the center of my jig, securing it to the jig with some temporary adhesive. Since this is such a large stamp, my magnet is a bit too large to secure my jig and fully clear the stamp, so I used a small piece of Purple Tape to secure my jig to the lower corner of my MISTI. This ensures I will stamp in the exact place should I need to reink a second time. I can now stamp. I forgot to take a photo of the first ink color, Stone; but here it is with two colors after the second stamping. I turned the whole jig 1/4 turn counterclockwise before stamping the second color, Sand. (I even penciled in an arrow, to make sure I always turn my jig in the same direction. Here is my image after turning the jig again 1/4 turn and adding the third color, Dark Roast. Once again I turned the jig 1/4 turn before adding the final Navy blue color. 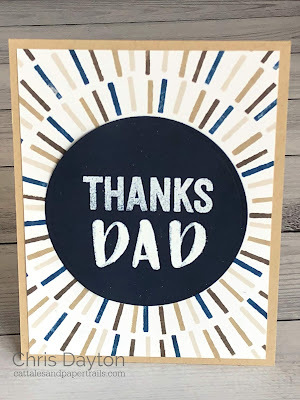 I used this Mosaic panel to create a Father's Day card. 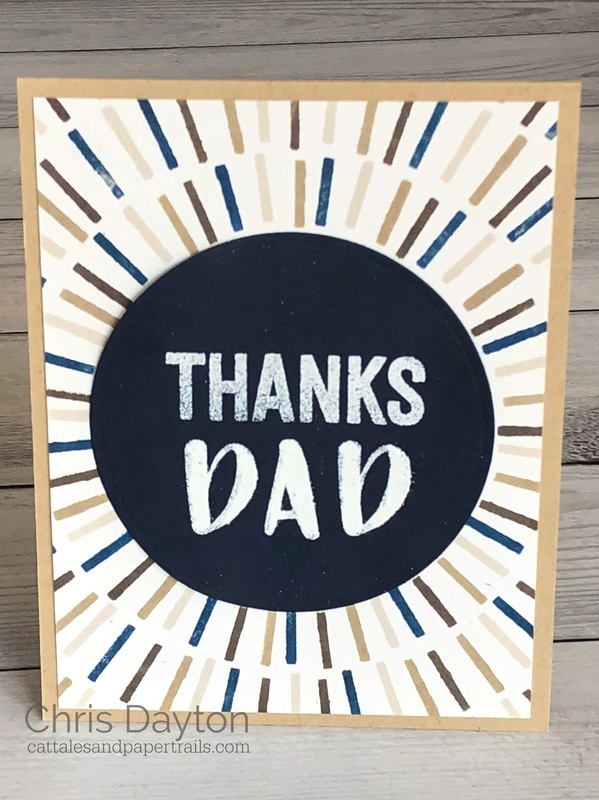 I trimmed it to 4 x 5 1/4", and used a large 3 1/8" circle cut from Navy cardstock and stamped and heat embossed the Thanks from the May freebie stamp set, Everyday Greetings, and also spelled out the word Dad using the letters from the Bold and Brushy Uppercase stamp set. 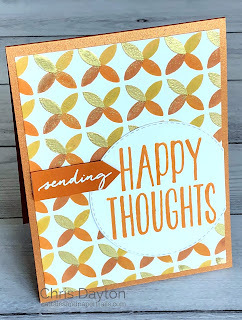 I used the same jig to create another card, this time using the Retro Petals Turnabout stamp set. This time I stamped the petals in Sunshine, Tangerine and Rust, and then stamped the fourth petal with Versamark and heat embossed it with gold. 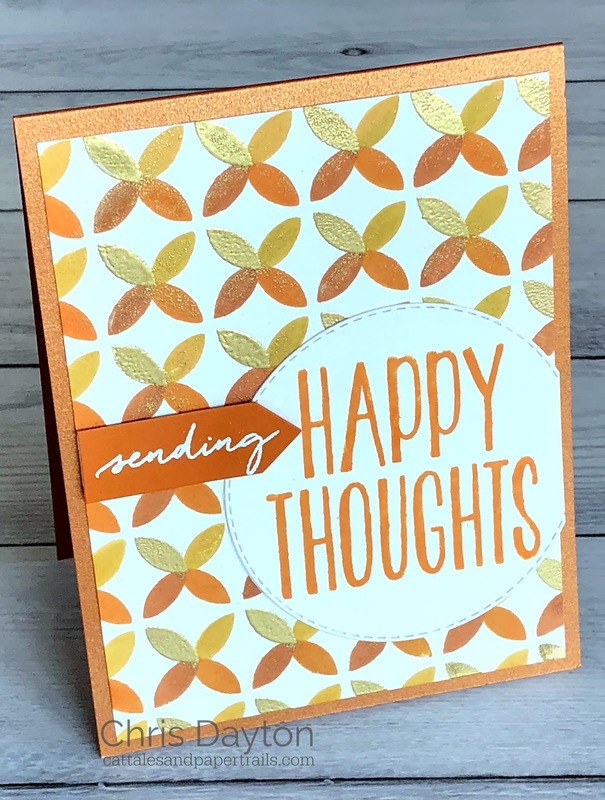 I finished the card with a stitched circle die and stamped the Happy Thoughts in Tangerine, and heat embossing the word Sending onto a small terra cotta colored piece of cardstock. These make such simple, but interesting backgrounds. I find them particularly useful for creating masculine cards, where the geometric patterns and color combinations can be star of the card. Great card and so easy using the Misti instead of CD cases ! Congratulations to prize winner Sue ! Fabulous backgrounds on these cards. I see I am the lucky winner--I sent an email. These cards are great! I love Concord & 9th’s turnabout stamps. Congratulations to Sue!